March 19, 2013 in "Canada", "japan"
When I moved to Japan, I sold my car. This was a SAD EVENT. My car was a cheerful yellow sunbeam of a VW Beetle that was capable of lifting the mood on even the darkest of days. This was especially good since --at 10 years old-- it started to become the source of some of those dark days as it went through a series of faults that made the CAA regret ever offering me automobile support. Regardless of my newly acquired familiarity with tow trucks, I was sad to lose it. Or at least, sad not to replace it with a younger, sexier model. Since Sapporo is a large city with good public transport, the practical need to own a car is low. That, and my practical ability to progress through the steps needed to buy a car in Japanese is also low. Then there is the snow, which makes locating your vehicle a genuine challenge once you turn your back for longer than about 6 hours. Combined with only a half-hearted attempt by the city to clear the roads, this results in some people giving up on their cars entirely in the winter months, letting them become snow covered car cakes in their driveway. Others set their children to shovelling out the vehicle, probably with the promise that they can play computer games when they finish. Since it would be deeply disappointing to spend six months digging out a car only to discover it wasn't yours and it was difficult to hot wire, I decided to walk to the city streets. Yet, there was something missing. Something bright and cheerful and … sunflowery. 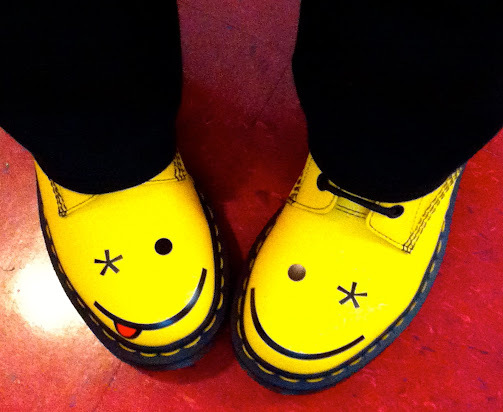 Last weekend I found the solution in a Dr Martens store; something to still take me around the city in a shade of sun beaming yellow amusement. And yes, this is also the message I am giving my students. And the world. And you right now.